Function Angel Eyes can be installed on any vehicle as an accent for your headlights. They can be found on BMWs and are a nice modification for any vehicle. 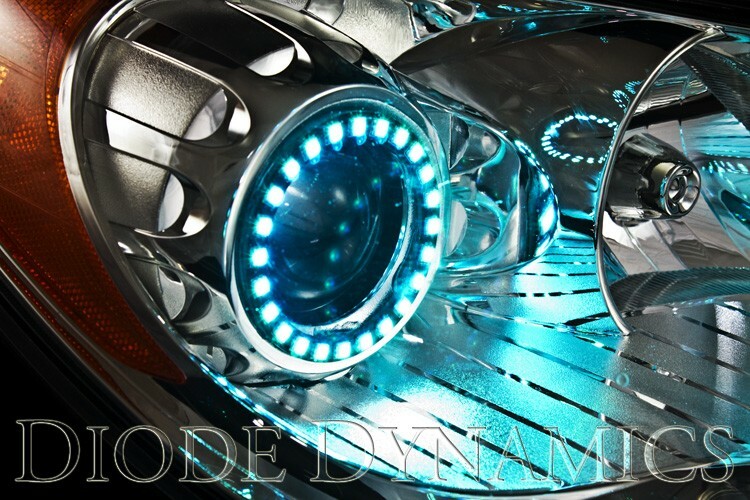 The angel eyes from Diode Dynamics are the highest quality and brightness available. Look around, you will not find better angel eyes anywhere for these great prices! Our rings were custom-designed for reliability and long life, and have been tested on your vehicle for perfect fitment. These angel eyes have been test-fit on your vehicle for perfect fitment. To read more about Angel Eye Rings, click here. RGB SMD Design These are LED rings which use 5050 size SMDs. The SMD LED chips are mounted directly on to the circular board, facing forward. The LEDs go all the way around the ring, for no "break" in the light as with other angel eye designs. This provides an extremely high light output in the forward direction. Typically, LED rings have resistors mounted directly on to the ring. Our RGB have improved durability and reliability by using external current regulators. The regulators are housed in a small, fully-potted (waterproof) regulator box, which is simply attached inline between the controller and the LED ring. RGB Multicolor rings have a standard 4-pin RGB connector, compatible with Diode Dynamics RGB controllers. Either controller can be used to control the rings. See below for a comparison video of the two controllers we offer. RGB controller is required. Please choose one in the drop down menu above.